Here’s a question that comes up all the time. In this article from July of 2016 Victor Shelton describes why it’s a good idea sometimes, and maybe not others. We talked about clipping pastures in June. I’m still getting questions and comments by email about it; all good. There certainly are two sides to this fence: those that think mowing or clipping pastures is just something that has to be done and those that think it wastes time, fuel, and does little good. I respect both sides and agree with both sides. The need to clip is site specific and a personal preference. By this time of year, most have made the decision on whether to clip pastures or not. If the pasture has been grazed once or twice already then it probably really does not have that many seed heads present, and depending on how it was grazed, weeds either. If you look at a field from a “windshield” view, it is usually going to appear to have a lot more seed heads than it really does. This was a topic recently on one of the Facebook grazing groups. Looking at the pictures that were presented, one would think or assume that it was a dense stand of seed heads in dire need of being clipped to try and maintain some decent quality. Additional pictures were added from a standing and looking down position and it was certainly clear that seed heads were not an issue with only one or two per square foot, not 40 or more as in some cases. If no or low seed head presence is your goal, then what is an appropriate threshold to justify clipping for them? That is a very good question which I’m trying to quantify myself. If the upper range is about 40 seed heads per square foot (yes, I’ve counted them) and my personal preference is less than 6, then my threshold or tolerance level is probably in that 30% range or about 12 seed heads per square foot. What I often find though, it’s a lot lower than that. Can I find another reason to justify mowing? Weed control is the next argument I usually hear. There is a huge range of tolerance for weeds. My tolerance level for multiflora rose and thistles is very low. Kathy Voth would tell me that I should teach those animals to eat those thistles and that is all good. If they want to eat them after I chop the daylights out of them, they can have right at it. If I have an abundance of annual weeds such as common ragweed, prickly pigweed, or cockleburs, then most likely I’ve messed up such by not allocating enough pasture for the timeframe, especially during wet weather. These weeds are opportunists; filling in areas where soil is showing and in the case of prickly pigweed, where nutrients are high such as where a hay bale was fed. Mowing might help a little, but I should do a better job of maintaining cover. Perennial weeds, such as ironweed, can certainly be a problem. Individual plants don’t generally present much of an issue unless they go to seed on ground that has a lot of thin cover. They do also spread from rhizomes. Mowing or clipping these prior to seed production is usually a good idea unless you maintain a very dense vigorous stand of forages that will compete with it. It, like giant ragweed in a corn field, competes with the forages for sunlight. I use canopy as a threshold with a tolerance level of about 20%. If I’m losing more than 20% of my sunlight, it is going to be at least clipped. Above 30%, it is certainly affecting forage yield and may justify some chemical type of treatment. Applying these herbicides at a time when they will be most likely to be transferred to the roots is ideal and for most perennials is later in the season when the plant is moving nutrients downward for winter storage. It is always better to spot spray or use a “wipe” type system over blanket coverage. Broadleaf herbicides are also hard on the swards valuable legumes and beneficial forbs. 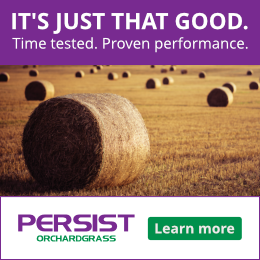 If you have sheep or goats available, either can help reduce weed pressures on pastures. They can be rotated behind or in front of the cows depending on who needs the highest nutritional needs. 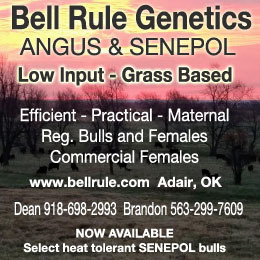 The third reason to clip or mow is help control pink eye in cattle. I would have a hard time justifying clipping for this reason unless you have an active pink eye problem. The seed heads do not cause pink eye, or at least not independently. The seed heads along with face flies, pollen and other eye irritants certainly can aggravate the situation though. Pinkeye occurs when there is a susceptible host (non-immune animal), the infectious agent (Moraxella bovis, pinkeye), and the environmental conditions that favor it (eye irritation that attracts flies that then can transfer it to susceptible animals). Keeping seed heads under control by clipping or mowing could be justified if pinkeye is presently an issue to reduce possible eye irritations but that is usually only the case with high amounts of seed heads present; controlling flies is the first priority. What is the reason for mowing? If it is to improve or maintain quality – have at it – just don’t mow any shorter than necessary. If it is purely for aesthetics – you might be better off leaving it alone. Taller forages produce more live roots providing some drought resilience, helping to shade out some weeds, providing for slightly cooler soils and maintaining moisture which can promote more growth from cool season forages instead of less desirable plants. They also have the added benefit of some wildlife habitat, especially certain pollinator species. Somewhere along the way we decided that pastures should look like mowed lawns. That quite often promotes monocultures instead of diversity, and possibly lower production especially if it turns dry. It is also an added cost that has to be paid for by the livestock enterprise. I intensively graze sheep – ewes, ewes w/lambs, and lambs followed by ewes, depending on the season – up to 600 before I got this old (now 73). I do it in western Oregon. I have found that no matter how many times a field has been grazed, there comes a time in late spring, when if you stayed on till the forage was fit to move off, some of the fields ahead would be getting too rank. The weather is stll a bit risky to hay and the yield would be low. But if you move the sheep on to the next lot and leave the one they vacate for at least several days so everything ‘stands back up’ after the traffic, up to several weeks you will get considerable regrowth. But the weedy annual grasses would go to seed. So before they make viable seed I clip it ‘high’. Low enough to stimulate regrowth and get the seed heads, but high enough to not cut down too much on leaf area. I leave the clippings layed out. This forms the equivalent of a nursery lattis cover. Gives shade, reduces soil temp, and eveaporation for added regrowth. The clippings turn yellow on top. . . but do not get ‘old’/mautre and loose quality. Then before the first grazing with weaned lambs I rake as many swaths into as big a windrow as the side delivery rake will make – swaths from both sides into one big windrow of ‘swath hay’, The grass in now mostly summer dormant. Lambs graze the regrowth and eat the ‘candy’ out of the windrow. When they are done, the ewes follow to clean up. By doing this I preserve ‘forage surplus to the grazing need of the time’, keep weedy/less desirable plants from propagating (if it wasn’t eaten by the grazing, by deffination it is not prefered sheep feed), add to total yield/plant, and have good ewe forage – without the cost of bailing/storing/feeding – for the ewes prior to fall green up. . . And it keeps the pastures pleasing to the eye to boot. I like to let some red clover go to seed to replace the gap left when the parent plants die. Always clipped the pastures when I could no longer see the lambs! Clipped much earlier this year as it was cool & rainy, pasture was lush & I was nervous about bloat. Worked beautifully- dried things out a bit, and although I thought I would probably have to do it again later on in the season, that has not proved to be true. Small farm- I graze about a dozen-16 lambs for the summer, this year I also have 10 Nigerian bucks grazing in with the lambs, and they have done a great job with the weeds. I rotate this herd between 2 pastures to avoid them grazing the plants down too far. What do you do? Add to your On Pasture Community’s knowledge base by adding your experience in the comments section. The National Grazing Lands Coalition brings you the Classic every week and they’re HUGE supporters of On Pasture and the On Pasture Community. I hope you’ll come meet them, and meet me and other On Pasture authors at the upcoming National Grazing Lands Conference in December to “Take the gamble out of grazing.” It’s a great opportunity to be inspired by folks just like you, make friends, and add lots of great information to your grazing toolbox. Can You Trample Your Way to Success?